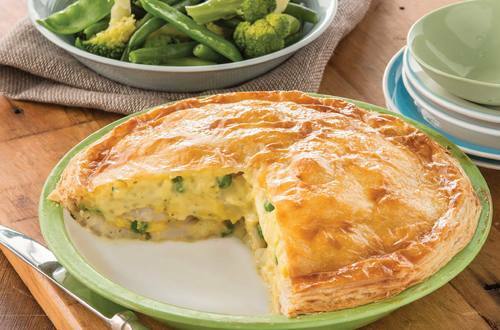 Create a classic fish pie with this simple fish pie recipe from Continental. Part of the hearty winter recipe collection produced by Continental. 1 Preheat oven to 190°C. Heat oil and sauté onion, add fish and lightly brown. 2 Add Continental Recipe Base, milk and peas and bring to the boil, stir until thickened. 3 Line a pie dish with 1 sheet of pastry, add fish and top with the remaining sheet, seal edges and glaze with egg. Place in oven and bake for 20 minutes until golden brown. Serve with steamed vegetables.